The big difference in cold-water corals is that they live alone. Warm-water corals are symbiotes. They contain algae that produce much of the energy that sustains the coral itself. But the algae can’t live where it’s cold and dark. So the coral animal has to fend for itself. It filters food from the water. Cold-water corals are found around the globe. 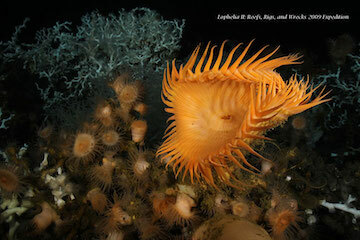 At high latitudes, they can be at depths of as little as a couple of hundred feet. Closer to the equator, though, they stay deeper. Some cold corals form colonies up to three stories tall. And some even form long reefs. The largest yet discovered is in Norway. It’s about 20 miles long and a couple of miles wide. Scientists have been paying attention to cold corals for only the last 20 years or so. Small submersibles have allowed them to explore much more of the sea floor, revealing an amazing array of deep-water corals. In fact, there could be as many species of cold corals as warm ones. But like their warmer cousins, the cold corals face dangers. Deep-water trawling is destroying many of them. And as ocean waters get more acidic, they could kill off many more. So for a coral, life is just as hazardous in the deep ocean as in a tropical lagoon.